Historians generally agree that tea was first cultivated in China. Eventually tea reached Europe as China began to trade with the Portuguese and Dutch. Later, as Britain began importing more and more tea, the British Crown issued a couple of royal charters - the Honourable East India Company in 1600 and the Massachusetts Bay Company in 1629. 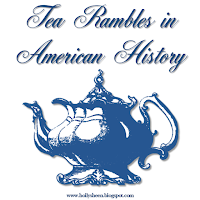 It wasn't long before the American colonies were enjoying tea as well and by the early 1700s large quantities of tea wares were also being imported. 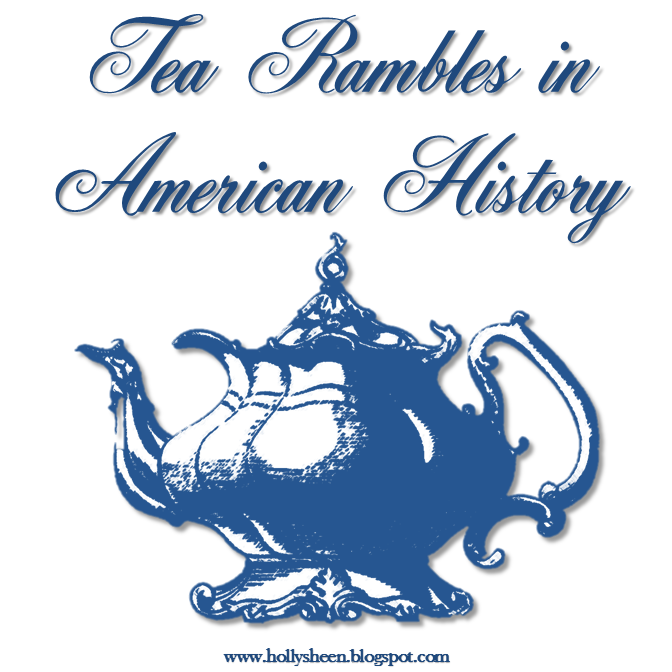 An early American tea set with a fun history. Of course, probably the most famous tea event in American history is now known as the Boston tea party which occurred December 16, 1773. 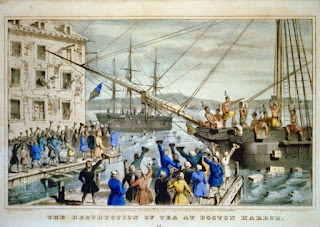 As a dramatic gesture of defiance to King George after much wrangling over taxes, several hundred chests of expensive tea (amounting to over $1 million in today's currency) were broken open and the tea was tossed into the Boston harbor. 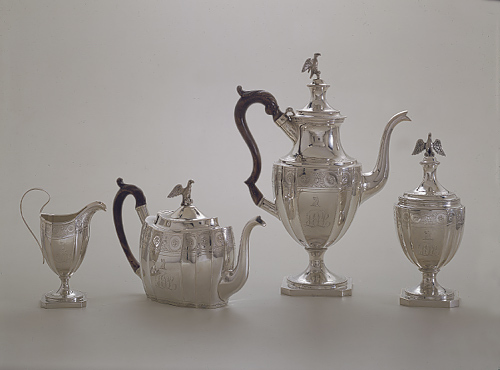 Apparently relations eventually smoothed over with the East India Company because in 1796 the company presented George and Martha Washington with a fine monogrammed tea service. Tea was not only sold as fashionable drink, but also as a tonic and medicinal herb. As with other concoctions that needed sweetening for palatability, honey or sugar was sometimes added. It seems that sweet tea apparently made an early appearance in history. Cold and sweetened versions of tea appeared before too long, often incorporated into various punches. In the United States, a typical tea punch recipe came into print in The Kentucky Housewife in 1839. The recipe, by Mrs. Lettice Bryan, is published as follows: "Tea Punch - Make a pint and a half of very strong tea in the usual manner; strain it, and pour it boiling (hot) on one pound and a quarter of loaf sugar. (About 2 1/2 cups of white sugar.) Add half a pint of rich sweet cream, and then stir in gradually a bottle of claret or of Champaign. You may heat it to the boiling point, and serve it so, or you may send it round entirely cold, in glass cups." Another early iced tea recipe is found in the cookbook Housekeeping in Old Virginia, edited by Marion Cabell Tyree, and printed in 1879. The recipe is published as follows: "Ice Tea. - After scalding the teapot, put into it one quart of boiling water and two teaspoons green tea. If wanted for supper, do this at breakfast. At dinner time, strain, without stirring, through a tea strainer into a pitcher. Let it stand till tea time and pour into decanters, leaving the sediment in the bottom of the pitcher. Fill the goblets with ice, put two teaspoons granulated sugar in each, and pour the tea over the ice and sugar. A squeeze of lemon will make this delicious and healthful, as it will correct the astringent tendency." 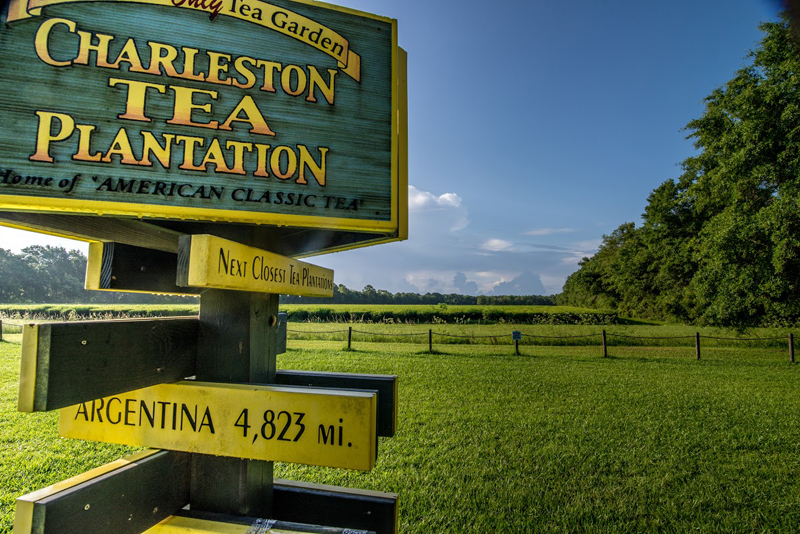 Tea plants were introduced in South Carolina where it was grown in the late 1700s. In fact, South Carolina is the only state to have grown tea commercially. It is believed that French botanist and explorer Andre Michaux imported the plants. 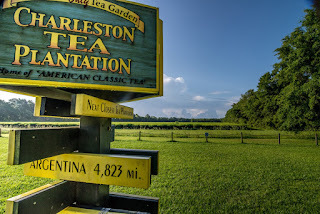 After years of various attempts, the tea crop was finally established down in the Charleston area on Wadmalaw Island where it thrives today on the 127 acre Charleston Tea Plantation. Sweet tea and iced tea have been a "southern thing" for over 150 years!